Saint-Domingue (French pronunciation: ​[sɛ̃.dɔ.mɛ̃ɡ]) was a French colony on the Caribbean island of Hispaniola from 1659 to 1804, in what is now Haiti. In 1791, the slaves and some free people of color of Saint-Domingue began waging a rebellion against French authority. The rebels became reconciled to French rule following the abolition of slavery in the colony in 1793, although this alienated the island's dominant slave-holding class. France controlled the entirety of Hispaniola from 1795 to 1802, when a renewed rebellion began. The last French troops withdrew from the western portion of the island in late 1803, and the colony later declared its independence as Haiti, its indigenous name, the following year. Prior to the Seven Years' War (1756–1763), the economy of Saint-Domingue gradually expanded, with sugar and, later, coffee becoming important export crops. After the war, which disrupted maritime commerce, the colony underwent rapid expansion. In 1767, it exported 72 million pounds of raw sugar and 51 million pounds of refined sugar, one million pounds of indigo, and two million pounds of cotton. Saint-Domingue became known as the "Pearl of the Antilles" — one of the richest colonies in the world in the 18th-century French empire. It was the greatest jewel in imperial France's mercantile crown. By the 1780s, Saint-Domingue produced about 40 percent of all the sugar and 60 percent of all the coffee consumed in Europe. This single colony, roughly the size of Hawaii or Belgium, produced more sugar and coffee than all of the British West Indies colonies combined, generating enormous revenue for the French government and enhancing its power. The labor for these plantations was provided by an estimated 790,000 African slaves, accounting in 1783–1791 for a third of the entire Atlantic slave trade. Between 1764 and 1771, the average annual importation of slaves varied between 10,000 and 15,000; by 1786 it was about 28,000, and from 1787 onward, the colony received more than 40,000 slaves a year. However, the inability to maintain slave numbers without constant resupply from Africa meant the slave population in 1789 totalled to 500,000, ruled over by a white population that numbered only 32,000. At all times, a majority of slaves in the colony were African-born, as the brutal conditions of slavery and tropical diseases such as yellow fever prevented the population from experiencing growth through natural increase . African culture thus remained strong among slaves to the end of French rule. The folk religion of Vodou commingled Catholic liturgy and ritual with the beliefs and practices of the Vodun religion of Guinea, Congo and Dahomey. Slave traders scoured the Atlantic coast of Africa, and the slaves who arrived came from hundreds of different tribes, their languages often mutually incomprehensible. Thousands of slaves found freedom by fleeing into the mountains, forming communities of maroons and raiding isolated plantations. The most famous was Mackandal, a one-armed slave, originally from the Guinea region of Africa, who escaped in 1751. A Vodou Houngan (priest), he united many of the different maroon bands. For the next six years, he staged successful raids while evading capture by the French. He and his followers reputedly killed more than 6,000 people. He preached a radical vision of destroying white colonization in Saint-Domingue. In 1758, after a failed plot to poison the drinking water of the planters, he was captured and burned alive at the public square in Cap-Français. The French Civil Code of Napoleon affirmed the political and legal equality of all adult men; it established a merit-based society in which individuals advanced in education and employment because of talent rather than birth or social standing. The Civil Code confirmed many of the moderate revolutionary policies of the National Assembly but retracted measures passed by the more radical Convention. The situation of slaves and people of mixed race was not improved. 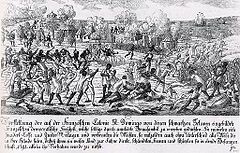 Haiti did not try to support or aid other slave rebellions because they feared that the great powers would take renewed action against them, as happened a few years later with Spain. [original research?] After the defeat of the French army, wealthy white owners saw the opportunity to preserve their political power and plantations. They attacked the town halls that had representatives of the defeated French authority. Elite planters took control of the former Spanish side of the island, asking Spain for a Spanish government and protection by the Spanish army. Later these planters created trade regulations that would further preserve their own wealth and power. Most whites that were left in Haiti proper were killed in a brutal genocide. ^ a b c "Dominican Republic – The first colony". Country Studies. Library of Congress; Federal Research Division. Retrieved 19 June 2008. ^ Emilio Rodríguez Demorizi, "Acerca del Tratado de Ryswick," Clío: Órgano de la Academia Dominicana de la Historia 22:100 (Jul–Sep 1954), pp. 127–132. ^ Von Grafenstein, Johanna (2005). Latin America and the Atlantic World (in English and Spanish). Cologne: Böhlau Verlag GmbH & Cie. p. 352. ISBN 3-412-26705-8. Retrieved 22 August 2014. ^ a b Chartrand, René (1996). Napoleon’s Overseas Army (3rd ed.). Hong Kong: Reed International Books Ltd. ISBN 085045-900-1. Retrieved 22 August 2014. ^ White, Ashli (2010). Encountering Revolution: Haiti and the Making of the Early Republic. Baltimore, Maryland, U. S. A.: The Johns Hopkins University Press. p. 63. ISBN 978-0-8018-9415-2. ^ Bollet, A.J. (2004). Plagues and Poxes: The Impact of Human History on Epidemic Disease. Demos Medical Publishing. pp. 48–49. ISBN 1-888799-79-X. ^ a b James, C. L. R. (1963) . The Black Jacobins (2nd ed.). New York: Vintage Books. pp. 45, 55. OCLC 362702. ^ Vodou is a Dahomean word meaning 'god' or 'spirit'. ^ Thomas E. Weil, Jan Knippers Black, Howard I. Blustein, Kathryn T. Johnston, David S. McMorris, Frederick P. Munson, Haiti: A Country Study. (Washington, D.C.: The American University Foreign Area Handbook Series 1985). ^ a b "The Slave Rebellion of 1791". Retrieved 27 November 2006. ^ Bollet, AJ (2004). Plagues and Poxes: The Impact of Human History on Epidemic Disease. Demos Medical Publishing. pp. 48–9. ISBN 1-888799-79-X.